I had this pasta dish in Rome - spaghetti with clam, garish with crushed fresh mint - the combination sounds innovative to me (is it common in your area?). Before my first bite I speculated the whole thing going straight down to trash (I hate mint), but no! The mint-y aroma simply charmed through the taste of ocean. Now back home, my pot of marjoram grows merrier than ever (it only had a few limbs throughout last summer in yard). The new branches keep coming out and yearning for 'try me try me!'. Well, its pine-y fragrance almost like menthol does make me nostalgic. So some marjoram is crushed in this clam salad... Bravissima! The basic rule for a great salad - use everything super-fresh. Old and withered vegetable still won't taste any better even after the salad dressing anyway. Here is my choice for this salad: clam, just cooked (octopus is great too! 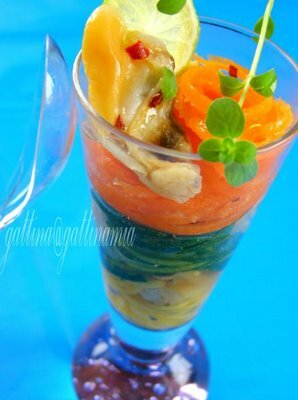 ), carrot, green and yellow zucchini. For the dressing: mix key lime juice, olive oil, a pinch of sugar, and little crushed marjoram. 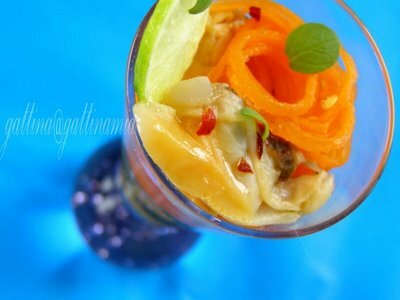 Toss with clam and vegetable. Sprinkle a few sea salt flakes and crushed red pepper before serve. I envy you now for the growing fresh marojam! :) Simply adorable! Wow, I think this is very innovative and sounds delicious. I want to grow some marjoram next year; I don't think I've ever had it fresh. I think most plants that are grown inside will benefit from being a little root-bound (crowded in the pot) so I'm guessing yours is just fine. wow, nice entry Gattina. looks so nice. Looks great Gattina! Your marjoram plant seems to be doing so well! Like you mentioned, I feel that this recipe would be great with calamari as well! 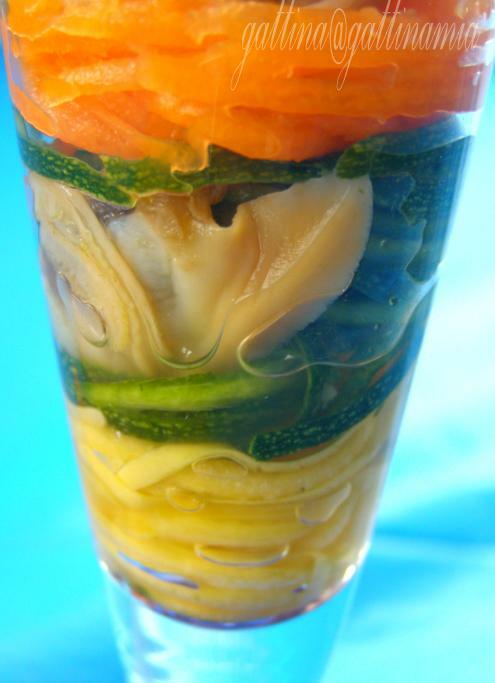 The clam salad is beautiful and looks so refreshing too. The colors of the salad are striking and would make any meal feel very special. Perfect for the holidays! Everthing is lovely, herbs, salad and all! Anh, a perfect timing for you to start gardening there. Kalyn, good luck! And thanks for the advice! lakshmi, thank you for the kind words. Monisha, oh yes, how can I forget that calamari!!! Asha, I guess everyone just looking forward to the X'mas season now! Angie, hope you get well soon! Could your hubby manage to cook you some tonic soup or something? Looks amazing! I've never seen yellow zucchini, but I'm glad you had it on hand to create this marvel! Oh gattina this looks wonderful. I'm not crazy about mint either because I got sick on some mint gin once but there are some Asian dishes I like it in. This dish, while not Asian however, looks like one I would love it in too. Great pics, I've never had anything like this before, I want some. Wow, what a unique way of presenting your salad haha. Btw, your pandoro tree looks very very nice and tempting! Awesome! I like marjoram, too! Gattina, what a lovely combination of colors! A very beautiful dish! I'm a fan of marjoran! Gattina - this looks amazing. I hope you will send it to Green Blog Project. I am hosting it for Winter Spring. You can leave the trackback in comments or send me an e-mail. I am not after cold seafood salads, but oh god i could eat this photo !! How do you pick these colors? this looks good and refreshing! love the colors! Hello all my friends! Sorry for my late reply because of my computer been down for a week! My heart-felt thank you for every lovely comment!